Yoga Paws Review: Do They Really Work? Have you decided to leave your yoga mat at home because of its size? Now there’s an innovative solution that will change how you practice yoga for the better. Yoga Paws Elite let you have a stress-free yoga experience anywhere in the world! Keep reading our Yoga Paws review. The Yoga Paws Elite, which cover hands and feet like socks, make it easy to practice yoga in a different way, without a bulky mat. Wear the paws on your feet and hands, and they act as mini mats, allowing you to practice yoga in an unobstructed way, still allowing for flexing of fingers and toes. They’re lightweight and small, easy to pack and store as well as use them whenever you have a spare moment for yoga. They easily fit in any travel bag or carry-on in case you’d like to relax with yoga while experiencing layovers. You can stuff them in your beach bag, hiking pack, vehicle glove compartment, work desk, or wherever you’d like to keep them for use at a moment’s notice. Whether practicing on a mountain, in a forest, or underwater, these paws can be taken anywhere. If you’ve always wanted to practice yoga in beautiful, destination locations, the Yoga Paws Elite will be your best friend. You can post pictures to social media so fans can admire your striking poses with no mat to mar beauty; you’ll look one with your environment, as they mold to your individual contours! Do you enjoy matching your workout clothing? If so, the Yoga Paws Elite comes in four colors, Rich Maroon, Classic Black, Midnight Blue, and Monsoon Grey. Choose one or more colors which best compliment your overall look! In addition to four colors, Yoga Paws Elite come in four sizes: #1 Women’s XS, Size #2 Women’s Small/Regular, Size #3 Women’s Wide/Men’s Narrow, and Size #4 Men’s Regular/Wide. Women and men should use the size chart to choose the best fit, which snugly hugs hands and feet. According to Amazon.com users, 83% of 160 total reviewers reported the paws fit as expected, and 17% said they fit smaller than expected. The paws will stretch a bit from use, so they should feel a little tight at first. If you find your paws do not fit correctly, it is easy to exchange sizes. Comfort is key. Hopefully after ordering and using Yoga Paws, you will not need to conduct exchanges. If for any reason you’re unhappy with one or all four paws, contact your seller. According to Amazon.com users, customer service is quick and friendly, resulting in happy yogis. Exchanges can be easily made if a paw has any flaws, or if color or sizing is not as expected. The paws are highly-rated on Amazon, with 75% of customers giving the Yoga Paws Elite 5 star ratings and 13% giving them 4 star ratings. As you can see, Yoga Paws Elite are a worthwhile purhcase, and with excellent customer service, you’re bound to be happy! Yogis care about the kind of surface practiced upon, and Yoga Paws work well on any surface! Those who have purchased the product from Amazon report satisfactory use on tile, wood, carpet, outdoor decks, and many other surfaces. Secure fit and cushion allow this kind of flexibility, pun intended! Customers also enjoy using Yoga Paws for hot yoga since the internal portion absorbs seven times their weight in sweat and provide a glue-like grip. Latex isn’t necessarily agreeable to the human body; with Yoga Paws Elite, you don’t have to worry about irritation or allergies because they’re latex-free! In addition to skin health, the cushioingn is great for those with metatarsal or ball of foot pain because it alleviates pressure. For extra cushioning, wear Yoga Paws while practicing yoga on a yoga mat. Those with arthritis, thumb joint pain, as well as individuals age 50 and older have reported that the paws provide needed comfort. The paws aren’t recommended for those needing extra support for injured or broken wrists, although they do have built-in arch support. Do you have pets? Have they ever pestered you while trying to practice yoga? Typical yoga mats are tempting for pets who like to chew on objects. If you’re tired of your animals chewing or clawing chunks out of your yoga mat, Yoga Paws Elite are a perfect solution! No longer will pets upset your mat when you’re practicing. Yoga Paws are less tempting chew-toys when not in use as well. They can easily be packed in a secure location away from any curious creatures. Are you tired of yoga mats falling apart or being poorly made? Yoga Paws Elite are sturdy; they don’t fall apart easily. If you’re tired of buying and washing multiple yoga towels, Yoga Paws can be your saving grace. Yoga teachers like to demonstrate moves for students, and Yoga Paws Elite make doing so easier! Moving around a yoga mat can be annoying, and even disrupt students trying to master poses. To maneuver around a room ensuring optimum feedback while moving safely, Yoga Paws are necessary! 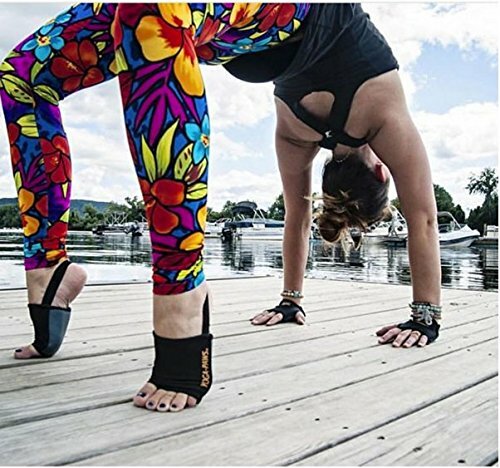 Yoga Paws Elite (Amazon link) are a breath of fresh air and freedom you can enjoy while practicing yoga poses anywhere! Become the kind of yogi you want to be, with no barriers to perform stances where and when you choose. The versatility possible while using these paws will offer a new, invigorating way to center yourself, giving a new perspective to yoga practice.